I am pleased to welcome to the pages of this blog my wife, Cindy. This past August, she and I went on vacation in parts of Germany that were, for the most part, new to us. When I travel in Germany I like to try to insert activities that have something to do with my family history project. This vacation I had planned a few nights in Thuringia, a part of Germany that my von Wurmb and Zahn ancestors came from. As this connection is specific to the Martin L. Wyneken branch of the family there are only very few Wynekens who share this ancestry. Still, our visit in Thuringia is worth writing about as it was very memorable and might prompt other people to pursue their own ancestral lines to see what kind of interesting places they can track down. What’s left now is a huge stone building with a tower, and there are distinct wings that obviously were built at different times. The tower has walls about five feet thick and is, I believe, the oldest part of the remaining building. When the family last lived there, three separate family units inhabited the various wings. Then Germany went to war, and the Communists took the land and estate buildings from all the rich old families in order to even everything out. The building was used for a kindergarten, and housing for poor families, and wasn’t kept up. When the Communist government fell, the building sat for a while, because the family no longer was rich enough to buy it back and restore it. Now it has been purchased, renovated, and turned into a hotel and restaurant by a wonderfully energetic couple, Regina Scholz and Helmut Pohl. It took them ten years to bring it to its present glory. First they had to rip out all the decaying interiors and build it all back up again, then scour the country for enough antiques to fill all the rooms and corridors. They made no attempt to keep the antiques authentic to any particular era, but old enough to give the impression of the various ages that people lived here. The house itself is incredible fun! It’s full of passages and odd nooks and doors that lead to surprising places. We actually had a breakfast room all to ourselves that had a huge stone hearth, a table big enough to seat twelve set for two, meat and cheese and eggs laid out, and breads and cereals and coffee and tea on a sideboard. We tried to feel like the lord and lady of the manor, but we felt more like eager children playing dress up. Our hosts were extremely helpful and welcoming, and only partly because of Matthew’s relationship to the von Wurmb family. It would seem natural if visiting von Wurmbs showed resentment at the manor no longer being in family hands, but this seems to be very little the case. I personally think it has come into very good hands, and the family apparently is pleased that it has been so well restored instead of being allowed to disappear into the landscape as it was in danger of doing. As an American and a modern person, I don’t like the idea of the ultra-rich living the easy life while the poor do all the work – but, setting that aside for the moment, being there was SO cool! 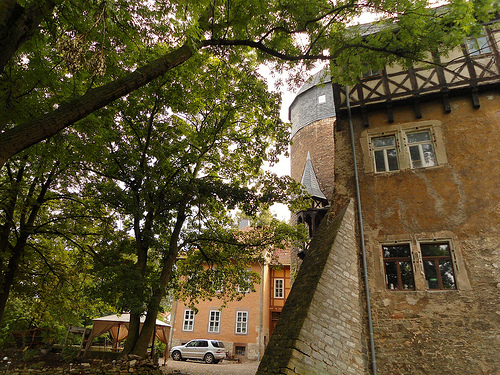 The old buildings, the huge trees, the tower, the crooked walls … to be staying in the rooms… it was fun to imagine being someone who was born there, whose family had been there for 200 years and was to stay for another 300. Real people lived there – not histories or stories or political or social classes you read about, but people: young children, mothers, fathers, grandparents. I lay in bed and looked up at the ceiling, and what occurred to me is that the von Wurmbs who lay there in that room looking up at that ceiling three or four hundred years ago were just humans like me. No different. The owner said one of the things he likes about running this place is the variety of people who stay here and all sit together around the same table. There are people from all classes and all walks of life, something that would not have been possible in the old days. I guess I prefer living in today’s world. I’m a modern person. But I love visiting the past, seeing how the other half lived, seeing the improvements that have been made in society as well as technology. Spending a night or two in the past helps me better to appreciate the century I’m living in now. This entry was posted in Uncategorized on 2012/11/11 by mpwyn.